Cut ribs into serving-size pieces. Combine seasonings together well and rub on all surfaces of ribs. Place ribs on covered grill over indirect heat and cook, turning every 15 minutes, for 1 1/2 hours. Spice up your grill with the delicious flavor of these cajun ribs. They are slow roasted over indirect heat so they are nice and tender. 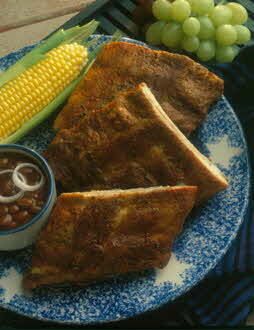 Serve with corn-on-the-cob and fresh grapes.